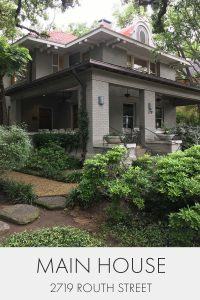 The campus of the Dallas Institute of Humanities and Culture, comprising the Main House, Stroud House, Cour Regard, and Nancy Cain Conference Center has a long history of engagement with the arts and civic life of the city. During the mid-1800s the site of the Dallas Institute was owned by J.M. Howell, whose interest in horticulture led him to open Howell’s Dallas Nursery. 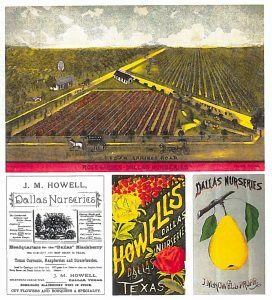 Howell dreamt of giving Dallas more shade and called his nursery an “experimental orchard.” Wanting to see what plants were best suited for the climate, he imported the first commercial shipment of plants into the state of Texas. He discovered that peaches and blackberries grew well in the arid climate and he is credited with starting the agricultural production of these fruits. When the Railroad came to Dallas in 1872 and 1873, J.M. Howell sold his land to the real estate developers Murphy & Bolanz who platted and sold plots to the booming population. MAIN HOUSE at 2719 Routh street was built in the late 1800s. It was demolished and the current Main House was built between 1905-1921. The area was known as “gallery row” in the 1970’s. The Main House was purchased by the famous art dealer Rual Askew in 1965 who operated the Rual Askew Gallery until 1980. Hundreds of paintings and sculptures were exhibited here through the years. It was so successful that in 1967, Askew built an addition which is currently used as a classroom. 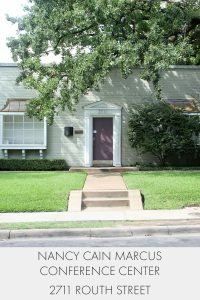 Present day, the Main House holds the Dallas Institute’s administrative offices. Former living spaces and dining rooms are used for events. STROUD HOUSE was built between 1892-1899 and had many occupants in its early years, but of particular note is the Ambler family. Mrs. E.T. Ambler was a prominent socialite and supporter of clubs, such as the Kensington Club, Alamo Kindergarten Club, and the Pierian Club; a ladies club whose purpose was to “gain knowledge.” She hosted events and club meetings in the front reception rooms. In Greek Mythology the Pierian spring, located at Mount Olympus, was a gift to the Muses from Pegasus. The spring, which arose at the spot where Pegasus struck the ground with his hoof, is believed to be the fountain of knowledge that inspires whoever drinks from it. 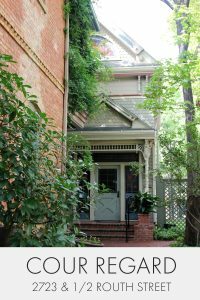 From 1930-1956, the Stroud House was owned by Mr. and Mrs. Fred Turner who lived there with their seven children. Mrs. Turner volunteered in city elections, started a Sunday school in her home, and hosted benefit teas. One event was a Silver Tea for the presentation of Mrs. W.J. Stroud. 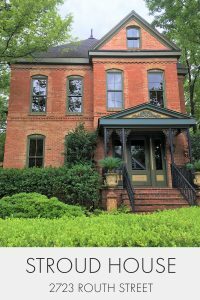 In 1973 the house was purchased by Mr. Alan Frakes who opened the Frame Store and had several tenants over the years, including Gibson-Bryant Fine Prints, a jewelry maker, and an antique furniture dealer. Today the Stroud house is used for both events and meetings. The Institute hospitality office is located within. COUR REGARD was built in 1987. It housed a bookstore, The History Merchant, operated by Richard Hazlett Jr. who dealt in used and rare books. The Cour Regard is a unique area within the campus and events such as the Classics at Cour Regard are held within the building. NANCY CAIN MARCUS CONFERENCE CENTER now sits where two houses were built and rebuilt several times. The land was ultimately purchased by the Church of Incarnation. The Church of Incarnation removed both houses and built the existing structure in 1962. The largest of all campus spaces, The Nancy Cain Conference Center is used for many events such as the James Hillman Symposium and Speaking of Movies. Other organizations within the city rent the space as well. Interested in renting a space? Contact us for a tour and pricing at 214-871-2440.